"And, it is this that strikes me again and again. A compulsion to conserve and preserve, be it heritage homes, elephants, or art forms. The Vallabhatta Kalari Academy is just a few kilometres away from the Riverside resort. 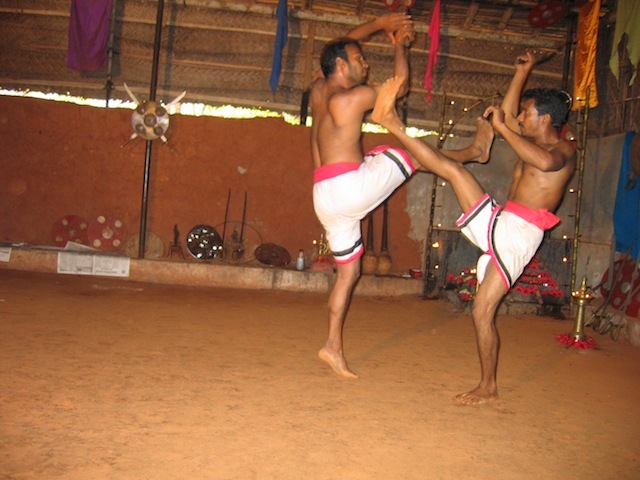 A classic example of a kuzhi kalari -a sunken arena - kalari payattu, the ancient martial art is taught here by the last descendant of the Muduvangatt family whose head was the commander-in-chief of the royal army of the Vettath Raja. Tracing a lineage of ten centuries, the kalari has managed to keep its traditional grandeur despite the lure of commerce. As I walked into the kalari, the earth cellar like area with its thatched roof, mud floor and array of weapons laid out on the sides, I felt I had stepped back in time. Then my eyes trailed to the kanni-moola [ the southwest corner]. Here the kalari deity sits adorned with flowers and lit with oil lamps. A silent spectator, constantly assessing, perennially judging all that happens before her eyes, Bhadrakali, the deity radiates a presence that tolerates no deviation from tradition. 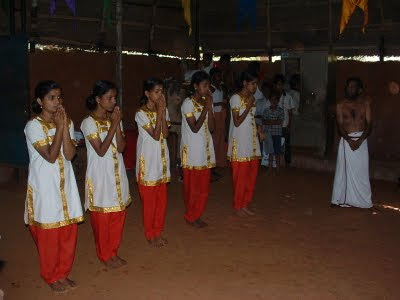 And, it is this I see as the kalari comes alive. The short stick and long stick fights, the dagger, spear and sword fights, in the hand combat and finally where a blindfolded student located a dagger hidden in the arena floor and then used the dagger to slice a cucumber placed on another student's body... it's only when the cucumber fell apart, I realized that I had been holding my breath....perhaps so did the deity, I thought. No matter how often you saw this, one couldn't discount the possibility of human error…"
This was a note written by Anita Nair in the India Today Travel Plus about her visit with us to Vallabhatta Kalari along river Nila. The last descendant of The Muduvangatt family, Viswanathan Gurukkal passed away yesterday after ailing for a last four years in Calicut. One of the first projects along Nila to be supported by The Blue Yonder since it's inception, we have vivid memories of this place and the man himself. Irrespective of caste, creed and gender, he trained more than 1500 students in traditional Kerala martial arts in Northern style. 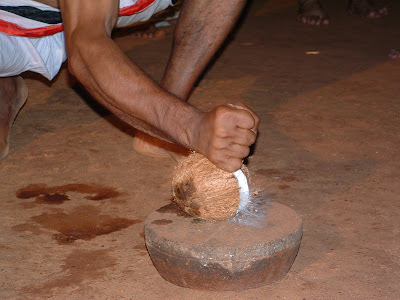 He was such a proponent that he developed his own style of training that came to known as "Vallabhatta" style focusing on norther kalari traditions. Old texts found in family attic reads the authority family had recognitions and titles given by "Vettathu Raja", the local King which says "Muduvangaatt should be in charge of eight countries ( 'desams') and protect the land from the enemies". They were protectors of Ponnani harbor. His family was the chief architect of war strategies during the "Mamaankam" which used to be held once in twelve years on the banks of River Nila in Tirunavaaya. 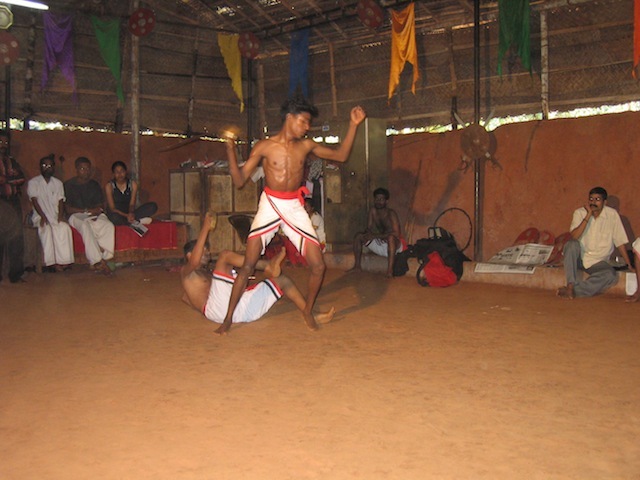 When Kerala state government decided to include "Kalari payattu" as one of the subjects in school, Viswanathan Gurukkal took an active role in deciding on the topic and training those involved in preparing the syllabus. For the past eight years, he was also leading the Kerala state kalaripayattu Association. When it was decided to re-enact the moments of 1684 Mamankam (where Zamorin came so close to death by one of the youngest of warriors), it was Vallabhatta Kalari that choreographed the illustrious action in a festival in 1999 in Tirunavaya. We bow with respect and love to the man who dedicated his whole life to sustain, preserve and propagate the martial arts tradition of Kerala. Another of Nila who will live through our memories. Visnathan gurukkal is The greatst person in india. He is the major part of kalari.